It’s that time of year when everyone claims to be Irish, time for the wearing of the green, the drinking of the green beer; a time for shamrocks, leprechauns, lousy versions of “Londonderry Air,” and lots of Celtic music. “A brilliant question,” she replied. “There is something that I can’t articulate about it that hits me, that calls up the whole image of the landscape of Ireland that I think is so beautiful and so feminine. It’s in the air of the song, it’s in the lyric---the lyric usually goes right to the heart, past the intellect and right to the heart. In the world of contemporary Irish music, Cathie Ryan is about as large as you can get. The daughter of first generation Irish immigrants, she’s been building a following on the Irish/Celtic/folk scene for nearly twenty years. Friday night, she brings her band to the Virginia Beach Central Library for a return engagement under the auspices of the Tidewater Friends of Folk Music. It’s an appropriate way to celebrate the Day after St. Patrick’s Day. Her parents moved from the British Isles to Detroit at the invitation of an aunt who advised, “There are three major motor companies and they’re always looking for work.” Her dad worked on the General Motors assembly line, and Cathie grew up during the heyday of Motown in that label’s hometown. She loved those soulful sounds, but she found herself drawn to the music of her parents’ native land. “I think there are a couple of reasons,” she explained. “I think because it is very simply songs about the heart, songs about how you feel, songs about how we relate to each other. They are really songs of the people. They are about folk. “For me as a kid growing up in Detroit, going to Ireland was such a gift. I mean, going from an urban environment where there was a lot of strife at the time, to this bucolic, mysterious landscape…and also seeing my grandparents on both sides. We had very little family in America, and suddenly there were cousins and aunts and uncles. You know, going out in the morning and milking the cows and sitting around the fire at night telling stories and singing songs. Neither of my grandparents had televisions, so it was really about what you gave to the group at night. My mother’s father was a storyteller, so he just told stories all night. And there was no light, no electricity in their house. He’d light a gas lamp and it was magical. “Then in my father’s mother’s house, she would play the fiddle next to the fire. People would come in, she’d move the furniture so everybody could dance. It was what you could bring from yourself to entertain, to be entertained. There was so much more of a connection to each other because of that. You weren’t sitting around focused on a television set in your own mind, you were sharing things. You also had to contribute. 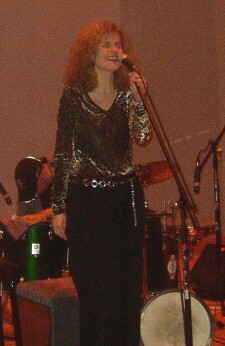 In 1987, she became the lead vocalist for Cherish the Ladies, an Irish traditional women’s ensemble. After seven years with Cherish, Cathie Ryan struck out on her own. Her three subsequent solo albums reveal an artist of impressive depth, an individualistic songwriter as influenced by James Taylor as she is by the myths of Ireland. If this were the early ‘70s, she might be getting notice and FM airplay alongside JT, Joni Mitchell and Van Morrison. But she also remains a superb interpreter of songs from the Emerald Isle. “Back in the early years when I first started,” she remembered, “before I had an audience that would come out specifically to see me and knew what I was doing, they would come and ask for ‘Danny Boy’ and ‘Tura Lura Lural’ and ‘When Irish Eyes are Smiling.’ It used to make me so angry, and then I realized there was no place for me to be angry about it. We were all in the process of educating the world about Irish music. A lot of people didn’t know there was music beyond the sort of pub songs of Ireland. So I feel really lucky that people want to come out and hear what I choose to sing. It’s a privilege. Cathie Ryan’s last CD, Somewhere Along the Road, is an extraordinary recording, steeped in a Celtic sheen but accessible even to those who think they don’t like Irish music. It is a powerful musical statement. The Farthest Wave is set for release next month. Friday night she’ll be here with her five-piece band of multi-talented multi-instrumentalists. It’s a show not to be missed, one of the best acoustic assemblages you’re likely to hear this year. And you don’t have to be Irish! copyright © 2005 Jim Newsom. All Rights Reserved.